Rino, this fun stuffed Javan Rhinoceros (also known as a Lesser One-Horned Rhinoceros) from the YooHoo and Friends collection, is not only cute and cuddly, but is also super silly with a "magical" sound when you squeeze the tummy! 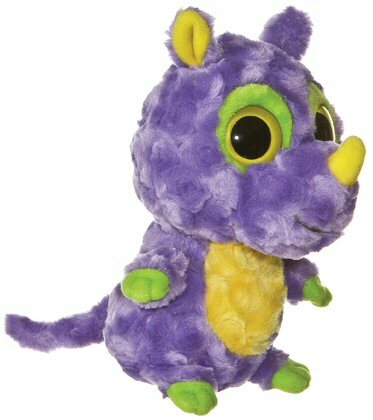 With soft purple swirly fur, yellow and green accents, big yellow eyes, and a cute little nose horn, this YooHoo Friends plush Javan Rhinoceros will put a smile on the faces of young and old alike. Note: YooHoo friend and stuffed rhinoceros Rino makes "magical" sound when tummy is squeezed. Roy, this adorable little Cushy Critter stuffed rhino, has soft light gray fur, gray accents, cool horn, and warm brown eyes.